All dive boats should carry 100% oxygen for use in acute DCI. Extricate from water and immobilise if trauma is suspected. If DCI is suspected or certain administer oxygen by mask. If the diver is conscious then rehydrate with non alcoholic fluids at a rate of 1 litre each hour. Never give the anaesthetic gas Entonox to a diver with DCI. As It contains nitrous oxide which worsens symptoms by increasing bubble size. Arrange transport eg ambulance, coastguard helicopter, to nearest emergency department and /or hyperbaric facility. Keep all diving gear with diver. Diving gear may provide clues as to why the diver had trouble (e.g., faulty air regulator, hose leak, carbon monoxide contamination of compressed air). Perform CPR and ACLS if required as well as needle decompression of the chest if tension pneumothorax is suspected. Keep the patient lying flat, and DO NOT put them in the head down position as this can worsen brain swelling. Continue to administer 100% oxygen to wash nitrogen out of the lungs and set up an increased diffusion gradient to increase nitrogen off-loading from the body. Aggressive resuscitation, and chest tube thoracotomy, if indicated. Administer IV fluids for rehydration until urinary output is 60-120 mls/h. Rehydration improves circulation and perfusion. Administer aspirin for its antiplatelet activity if there is no active bleeding. Treat patients for nausea, vomiting, pain, and headache. 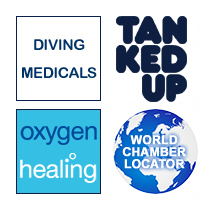 Contact closest hyperbaric facility (or DAN for referral) to arrange transfer and try to keep all diving gear with the diver. The diving gear may provide clues as to why the diver had trouble (e.g., faulty air regulator, hose leak, carbon monoxide contamination of the compressed air). Patients with apparently mild symptoms can have dramatic improvement and complete resolution.on oxygen alone. This improvement should not dissuade the practitioner from referring and transfer for HBO and recompression as relapses have occurred with worse outcomes permanent physical or mental disability. There are several types of hyperbaric chambers ranging from small monoplace (single person) chambers to multi-place and complex multiple lock-out chambers capable of simultaneous treatment several patients with their attendants. Some chambers have the facilities to maintain critical care monitoring and mechanical ventilation. The basic theory behind HBO therapy is to first repressurise the patient to a depth where the bubbles of nitrogen or air are made smaller and the gas redissolves into the body tissues and fluids. Then, by breathing higher concentrations of oxygen, always with short air breaks a larger diffusion gradient is established. The patient is slowly brought back to surface atmospheric pressure. This allows gases to diffuse gradually out of the lungs and body. Treatment tables govern the exact combination of timing and depths. Modern diving treatment tables were developed primarily by the US Navy with some minor modifications by the US Air Force. In the UK we use similar Tables devised by the Royal Navy. The commonest table to initiate treatment is called Table 62. This takes 4 hours to complete. With early recognition and treatment over 75% of patients improve. If there are still symptoms after the first treatment then retreatment is indicated. The retreatment table is called Table 60 and takes about 1 hour to complete. Retreatment will continue on a daily basis until there is full symptom resolution or there is what we call a plateau in treatment where there seems to be no more change in symptoms from one retreat to the next. Even with significant delays in recognition and treatment of DCI, positive results are obtained. These delays can be up to 10 weeks! An important issue is transport of the patient to the closest hyperbaric facility. This is frequently accomplished by land transport; however, occasionally air transportation is required. Helicopter transport necessitates the pilot maintaining altitude at < 500 feet. Fixed-wing transport should be limited to aircraft that can maintain cabin pressure at surface 1 atm (e.g., Lear Jet, Cessna Citation, military C-130 Hercules).